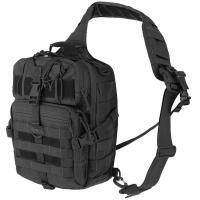 Maxpedition 0423B Malaga Gearslinger -Black FREE SHIPPING! The Maxpedition Malaga Gearslinger is a large tactical shoulder bag with plenty of internal and external storage space for secure, organized equipment carry. Its ambidextrous strap can be rapidly transitioned from one shoulder to the other, and includes PALS webbing and a slip pocket for storage. The slimmer sternum strap provides a more secure fit, and its buckle features a built-in emergency whistle. Inside the bag, multiple pockets, mesh pouches and elastic organizers make it easy to keep your gear separated and accessible. The large exterior rear pocket provides extra space, and comes with a loop field for a concealed carry holster. The bag is made from wear-resistant 1000 denier nylon, and features a water-resistant triple polyurethane coating and a Teflon fabric protector. Excellent bag and fast shipping. ©2002-2019 CopsPlus.com: Maxpedition 0423B Malaga Gearslinger -Black FREE SHIPPING!